My first Christmas card of the season using It's Cold Outside Tilda from Magnolia. I broke open my Webster's Pages papers "Christmas Story" that I purchased last year. I am a paper person so my whole card evolves around showing off the papers. 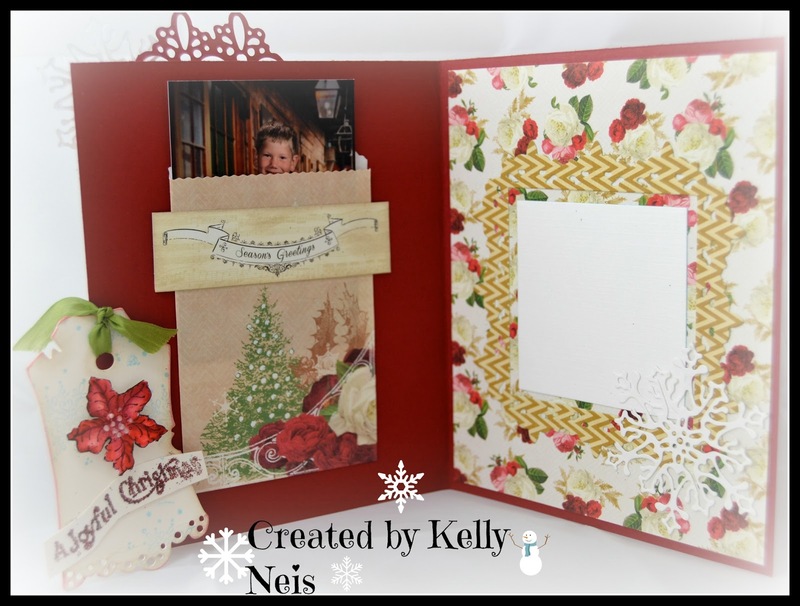 Magnolia doohickey snowflakes, Christmas Lace and LaLa Land poinsettia's make up the dies I used on the front. 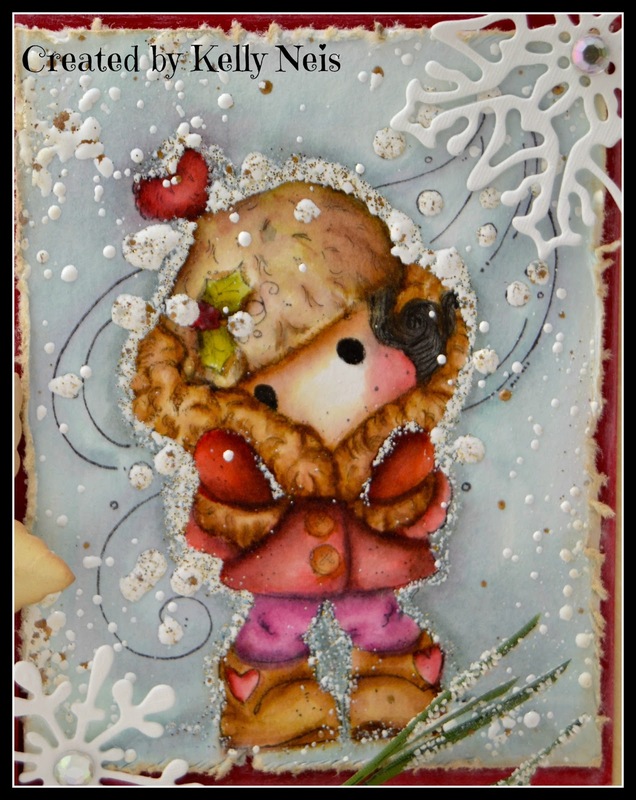 Tilda is colored in Distressed Inks and while she was still wet I did the Frantage Shabby White by Stampendous, it adhered to all the wet areas around her which was a happy surprise look. Always Believe is part of the paper pack from Webster's Pages. The Inside I made a pocket with the envelope from Webster's Pages and inserted my youngest childs school photograph, after they take it out I made a tag using Magnolia doohickey and 2 Magnolia stamps. This is just lovely, your colouring is so fab ! I'd say you're getting off to a good start. This is absolutely gorgeous in coloring and design, Kelly! Love your inside pocket - such a great idea Kelly. Your whole card is wonderful, and yes, as Christina mentions, you are off to a good start. will have to give myself a kick somewhere..... Hugs. Oh Wowzer!! those papers are gorgeous Kelly! and so deserve to be shown off!! 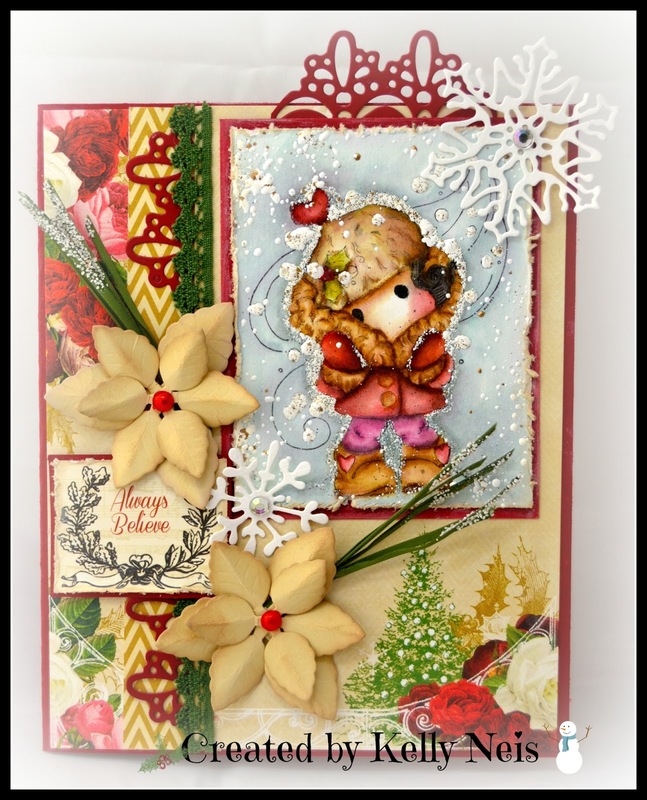 I love the sweet Tilda image and the pretty flowers and snoflakes are just perfect… a really stunning card !! You have coloured her beautifully Kelly. Love how you have coloured the fur and the papers are scrummy. Could you tell me where the grassy leaves are from? Fantastic Card! Love the colors and your details are fabulous. Gorgeous inside and out. You are off to an awesome start! I have not made any Christmas cards yet. I got to get away from my sewing machine!! Beautifully designed and decorated Kelly. Your coloring is out of this world good. I wish I could come up there and take coloring lessons from you. Tilda is gorgeous! You have had to have had some pretty cold weather - we had a little snow and the temps have been down in the low teens. 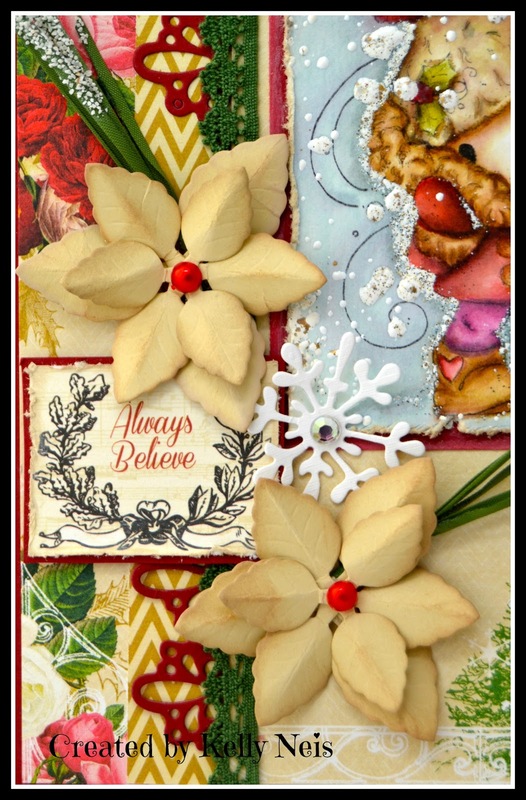 Love your poinsettias - fantastic die. Keep going kid!! Gorgeous work Kelly! You know I love your colouring but this one is really neat the way the Frantage is placed around the outside of the image... very creative and a 'new trend'. Such pretty papers too and I also like the poinsettia. Love those snowy Frantage highlights on your deliciously coloured image, Kelly - she's so cute all wrapped up in her furs. Another delight of a card!